I wasn't very impressed with the previous two books by King that I read (collections of short stories to be precise - "Just After Sunset" and "Night Shift") so I approached "Bag of Bones" with some apprehension. King returns to a familiar Maine setting. The narrator, Mike Noonan, is a novelist who suffers from a writer's block after untimely death of his pregnant wife. Four years pass and Mike hasn't still managed to overcome it. What's more, he is plagued by nightmares. He manages to keep up appearances as he wrote some novels before the his wife's death. Eventually, he realizes that his life cannot continue this way and attempts to confront his past. He decided to move into Sara Laughs, a summer house which is filled with happy memories of time spent together with his wife. Even more vivid nightmares begin to haunt him there and he soon realizes that there are some troubling secrets connected with the past of Sara Laughs. During his first day he meets Kyra - a 3-year old wandering alone along a road. He rescues her and soon after meets her mother, a 21-year old Mattie. Their fates become interwoven throughout the rest of the novel. 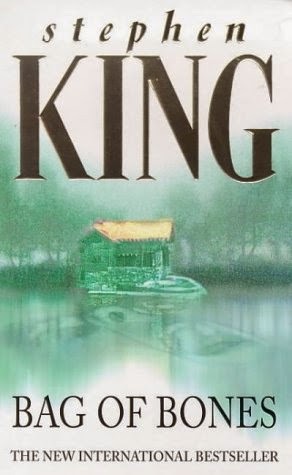 While this novel features many elements common for King's work (Maine, a writer, troubling past that resurfaces, the supernatural), it is still a very enjoyable read. A significant part of the novel takes place before the protagonist travels to Maine. The real actin takes a while to start but I didn't really see it as a problem. I personally feel that King is very good when he writes about normal life, in particular about the emotional sphere. His descriptions have an authentic feel to them. In Bag of Bones the supernatural doesn't surface until late in the book. For a major part, the novel deals with human drama and it's hard not to sympathize with Mike, Kyra and Mattie. When the old ghost, visions and other unusual elements take on a more important role, the book loses its authentic feel but thanks to a few unexpected twists in the plot it still manages to keep you captivated until the very end. What I probably liked the most were the descriptions of Sara Laughs. An old summer house that at first seems filled with memories of happier past. However, it takes on a new meaning as we learn more about its past. Sara Laughs seems to have a language of its own, consisting of subtle noises and movements of certain elements. Another thing worth mentioning is the audiobook version. It's read by Stephen King himself and he is doing a great job. Also, there are fragments of music interwoven with the narrative that create a very nice atmosphere.